If you are in a Theatre class, or the parent of a student in a Theatre class, sign up for Remind to get important reminders and updates! Below are links to Google folders with digital materials for all Theatre classes. This is something new that I'll be starting to do in the 2018-2019 school year. I will be doing my best to make sure it stays updated. However, if you need something and it is not in the link/not updated, please e-mail me (sfox@mckinneyisd.net) and I will add it. 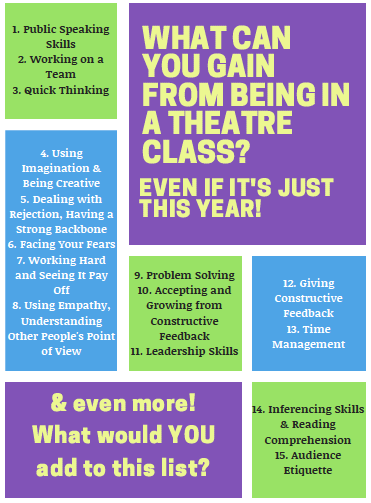 **Also - keep in mind that most of the assignments in the theatre class are participation/performance-based. Attendance is key to success for the theatre class​.